Creativity at Google isn’t just limited to the time we spend in front of our keyboards—many of us are also enthusiastic about making things with our hands. At our Google Workshops, for example, employees have the chance to use sophisticated tools and machines to physically prototype their ideas. The Street View trike and several components of our self-driving cars were built in these workshops. It’s also not unheard of for Googlers to build their own zip-lines, perform crazy experiments with giant lenses and just get plain silly. Our own Maker Faire theme is simple: “Dream, design, build. Repeat.” At the event, we’ll demonstrate how Google technologies, like SketchUp and the Android Accessory Development Kit (ADK), can help you take your project from idea to object. In keeping with the DIY vibe, our booth was constructed three full-size recycled shipping containers and outfitted with big screen TVs, 3D printers, CNC cutters and, most importantly—robots! Folks from the Google SketchUp team and the newly-formed Cloud Robotics team will be on hand to walk you through the steps of of designing, fabricating, building and programming your own robot. Our booth will also have demos, games, giveaways, hands-on activities for both kids and adults and talks from folks like MAKE Editor-in-Chief Mark Frauenfelder. And to top it off, we'll open Maker Faire each morning with an Android-powered weather balloon launch at 10:00 am PDT (weather permitting). 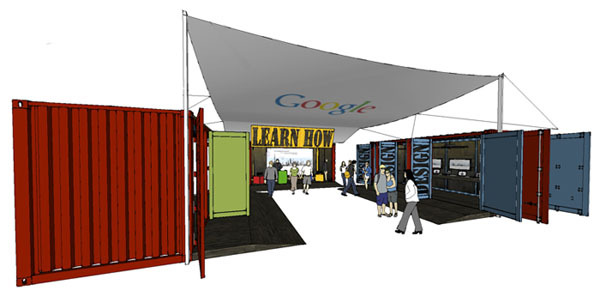 See our Google at Maker Faire site for a full schedule of Google events, and make sure to follow @sketchup on Twitter for updates throughout the weekend. Fellow Makers—we hope to see you there!